Basketball Defense: Nobody gets by... NOBODY! Basketball Defense: Defend the castle! Basketball defense is an art and a game in of itself. It's just you, the offensive player, and the basket. Now the main objectives are to keep the other player from scoring, from getting open, or forcing a turnover. 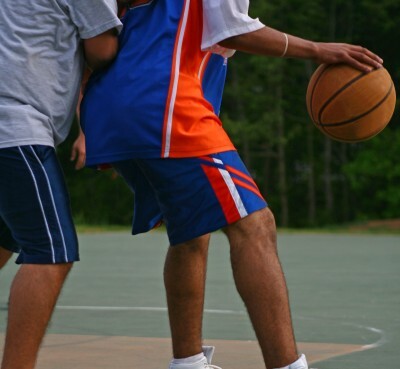 There are a few situations in one-on-one defense that you'll find yourself in. First position: the offensive player is facing up to you. Stand in front of him/her with your knees slightly bent in a ready to pounce stance. STAY RELAXED. BE LIGHT ON YOUR FEET in anticipation for a quick step. A tense stiff defender is going to get burned. Keep in mind that your goal is to ALWAYS STAY IN FRONT. In order to do that, you got to be able to move your feet very quickly because as a face up defender, you will have to go from side to side and back peddle. Always keep your eyes on the player’s midsection or belly. Naturally players will tend to look at the ball; this is a bad idea because first they might get dizzy, more importantly the person doesn’t necessarily go where the ball goes. The player may be a fancy dribbler and fake to one side and go to the other. Put one of your forearms on the players back and resist if they back in but don’t push them. HOLD YOUR GROUND. 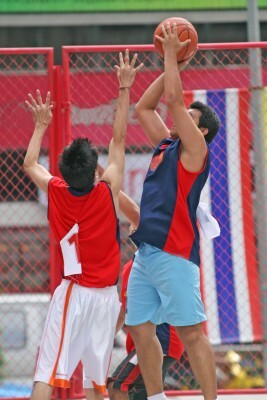 Use the other arm to get a steal or block the shot should the player decide to shoot. "pulling out the rug" is a very effective defensive technique. When your defense assignment is posting up and backing into you very aggressively, hold your ground (push back a little even), then instantly let go; back away or step to the side. Often times, the player will either fall down or back peddle to regain his/her footing, or get called for a travel. 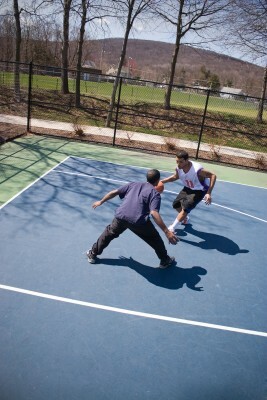 First situation: You are face to face guarding your opponent while another player on their team has the ball. Stay in front of him at all times AND look out for screens as he's moving left to right. If you see a screen coming, either go OVER or UNDER it, meaning you keep following the players movements while simply moving in front of the screen or behind it. It's like moving around an obstacle. NEVER LOSE SIGHT OF THE BALL, GET IN A HABIT OF KEEPING AN EYE ON THE PLAYER YOU'RE GUARDING AND THE PLAYER WHO WAS THE BALL. I KNOW THAT SOUNDS WEIRD, BUT ITS NOT AS HARD AS IT SOUNDS. FIND A MIDDLE GROUND WHERE YOU CAN MAINTAIN VISION OF BOTH. Get ready to chase relentlessly, wave your hands out, anything to deny the pass and discourage their teammates from passing to them. When the player is inside the 3 point line, keep one hand on the player, no grabbing or pushing, just a touch to monitor their movements. Jump at(not on!) the shooter with either one hand or two hands up. You’re setting out to accomplish one of two things. keep in mind that the player may do a pump fake to get you in the air. In fact, more than often, players will do a pump fake first, then shoot or induce a foul. Many times you won’t be able to block the shot because the player happens to be experienced or multi-dimensional. He may have a quick release or he may get up in the air quite high. There are a couple of tricks you can apply. Remember, you want them to miss the shot; so, as soon as you know they’re gonna shoot, run at them on their shoot arm side. ie if they’re right handed, run up towards their right side. Believe it or not this can be incredibly distracting for a shooter. Another thing you can do is to block their eyes with your hands. Just put a hand in their face like you mean it. You can do any of these 3, or you can do all of them; its up to you.